A cheap blender is OK if you make smoothies twice a year, but once you start really incorporating smoothies into your diet, you will want to upgrade to something more powerful and reliable. 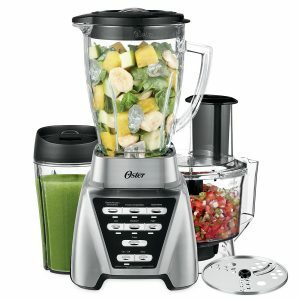 A mid range blender is also going to allow you to move on to making salsa, soups and other blended foods. It’s a worth while investment and will open a whole new range of foods you can make in the comfort of your own kitchen. Mid range blenders are often the best value. You get a high powered machine that can be used as a food processor. Mid range blenders have high quality components that won’t break with daily use. And the truth is, the highest quality blenders are meant for restaurants that are going to be running the blender for hours every day. This is vastly different from making one or two smoothies a day, which is what most people will use a blender for. I’ve looked at a lot of blenders and the Oster Pro 1200 Blender is definitely the best blender available for less than one hundred dollars. This blender if a high quality product, with the addition of a smoothie cup (similar to a bullet blender) and a separate food processor attachment. The first thing to realize is that the Oster Pro 1200 is a great quality blender. That in itself should be enough for me to provide this recommendation. This blender will chop up ice, fruits, nuts, and just about anything else you throw into it. It’s got a glass jar, so you don’t have to worry about plastic contaminating your food or getting warped in a dish washer. The blender has a dual-direction blade technology which blends in forward and reverse. This creates a better blended result and your smoothies are truly blended all the way. You won’t see a bunch of chunks left over in this blender. Along with a great blender, you also a smoothie cup and a food processor attachment. So you basically get two additional products for free when you buy this quality blender. You get a smoothie cup that makes taking smoothies to-go quick and easy. You also get a food processor which will greatly expand the types of meals you can make. You’re not just getting a smoothie making blender. Are you worried about how long to blend your food? Do you try to do too many things at once in the kitchen? Well, the Oster Pro 1200 Blender comes with multiple pre-built blender settings. These settings work on a timer, so you can press a button and the blender will blend until your food is ready, and then the blender will stop on its own. This is a great little time saver, and will take away the stress of not knowing how long to blend for. This blender comes with a motor that is strong enough to crush ice, frozen food, and anything else you may want to add to your smoothie. The blender motor can reach up to 1200 watts, and has an average power of 900 watts. This is very powerful for a blender that costs less than 100 dollars. The motor is all metal (unlike some other blenders that use plastic) so you know that it will last you a long time. I mentioned that the blender comes with a smaller smoothie cup that is great for taking smoothies to work or to the gym. The regular glass jar that the blender comes with is awesome. It’s glass, so it is fully dishwasher safe. It’s made of a spacial type of glass that if broken will crack instead of shattering. Think of a car windshield. They crash rather than shatter. This means that this blender if super safe. The best feature of the Oster Pro 1200 Blender is an extra wide blade. This stainless steel (10 year guarantee) blade is 3.5 inches long. A wider blade will catch food better and help the food flow down into the blade. A wider blade moves pulls down the food to the blades. This means things mix better. You not have to stop this blender and move the ingredients down by hand. Thicker smoothies are easier to make with these wide blades. This is in addition to the forwards and backwards spin of this blender. Combined, together these two features will blend the thickest smoothies. This is one of Amazon’s best selling blenders, and it is a fantastic deal for under $100. You can read reviews and find more information about this great blender.